There is no room for nonessential weight when it comes to your daily work attire. Not only are you concerned about maintaining your flash fire and arc flash protection, you also hope to stay dry, warm and comfortable as the weather fluctuates over the course of the day. Selecting a FR layering system designed specifically to pull moisture away from your body, layer by layer, is essential so you can focus on the job at hand, not your clothing. 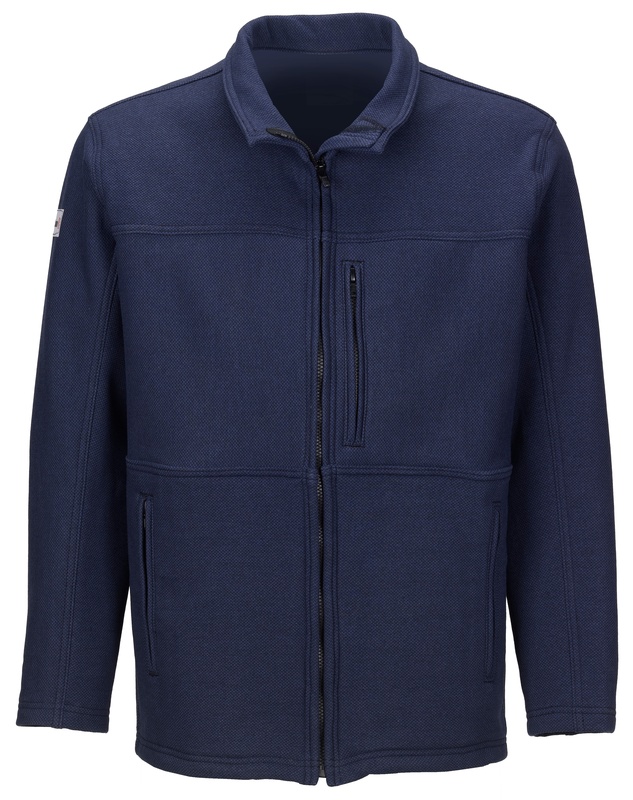 Lakeland’s newest high performance flame resistant apparel is made with a combination of fibers that ensure permanent moisture wicking for the entire life of the garment. We’ve mastered the balance of fiber blends to ensure that safety on the job is the first priority. Only Lakeland offers a layering system with permanent moisture wicking technology in every single layer. From base layer to button up shirt, hoodie to outer jacket, Lakeland’s layering system offers moisture wicking technology that will never wear out, wash out, or stop performing for you. Built to move. Each component of the layering system is built with added stretch, so it is designed to move as freely as you do. A beveled tail for warmth. Designed with a longer, swooping backside, your midsection will remain protected from the elements whether you are reaching high or bending forward. Water and wind resistant. Your layering system should protect you even as you add or remove layers. With Lakeland, our outer wear offers the same water and wind resistance, so you can feel confident in your apparel. Dual certified. 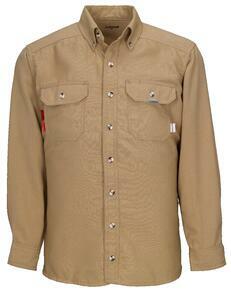 Remain safe on the line with dual certified layers to protect you from any potential hazard on the job. Solid protection. 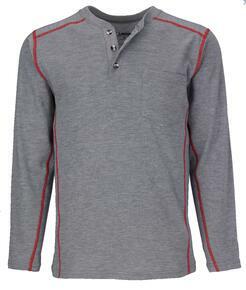 Our knit base layer has a protection value of 16.4 CAL / CM2, and is the only Cat 2 available in the market. Superior wicking strength. Get the sweat off your skin faster with the industry’s leading wicking technology. Vertical Cut Pocket. Unlike the typical kangaroo pouch, nothing can fall out of our specially designed pocket with a vertical seam. Better storage. Better protection from the elements. Hidden interior drawstring. 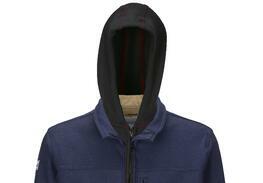 Designed to remain almost invisible, the hidden drawstring falls on the inside of the hoodie for added safety. Built for style, comfort and safety. How many hoodies would you wear out on the town? This one can add some style and safety to your wardrobe. Ribbed, knit sleeve cuff. There’s nothing worse than a sleeve that rides up when you put on your jacket or reach for tools on the job. We solved that problem with our exclusive ribbed, knit cuff. Extremely Light Weight. Get the weight off your back with this extremely lightweight, maneuverable fabric. Smooth Polymer Finish. The extremely abrasion proof, smooth finish means airborne particles won’t stick to your jacket surface. Zipper hand warmer pockets. Give your hands a rest and some added warmth with our speciality designed hand warmer pockets. Cell phone pocket. Keep what you need within reach with a perfectly placed pocket that’s easy to access on the line. As you select your layers, ensure that each is constructed with permanent moisture wicking capabilities to keep you warm and dry on the job. 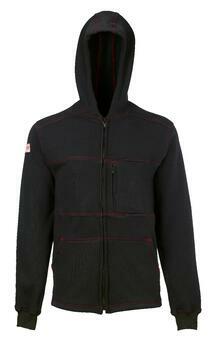 If one layer blocks moisture in, the effectiveness of your layer system will be compromised. Interested in learning more? Download our cold weather layering eBook that discusses how to effectively layer your FR apparel. Designed by linemen for linemen, Lakeland FR high performance combines superior moisture wicking fibers, style and functionality. Only Lakeland offers a layering system with permanent moisture wicking technology in every single layer. From base layer to button up shirt, hoodie to outer jacket, Lakeland’s layering system offers moisture wicking technology that will never wear out, wash out, or stop performing for you. Download the eBook now. Superior Performance, Protection and Comfort.